idx = kmeans(X,k) performs k-means clustering to partition the observations of the n-by-p data matrix X into k clusters, and returns an n-by-1 vector (idx) containing cluster indices of each observation. Rows of X correspond to points and columns correspond to variables. By default, kmeans uses the squared Euclidean distance metric and the k-means++ algorithm for cluster center initialization. idx = kmeans(X,k,Name,Value) returns the cluster indices with additional options specified by one or more Name,Value pair arguments. For example, specify the cosine distance, the number of times to repeat the clustering using new initial values, or to use parallel computing. [idx,C] = kmeans(___) returns the k cluster centroid locations in the k-by-p matrix C.
[idx,C,sumd] = kmeans(___) returns the within-cluster sums of point-to-centroid distances in the k-by-1 vector sumd. [idx,C,sumd,D] = kmeans(___) returns distances from each point to every centroid in the n-by-k matrix D.
Cluster data using k-means clustering, then plot the cluster regions. 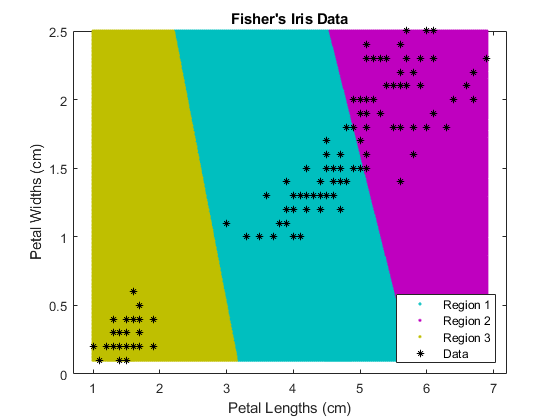 Load Fisher's iris data set. 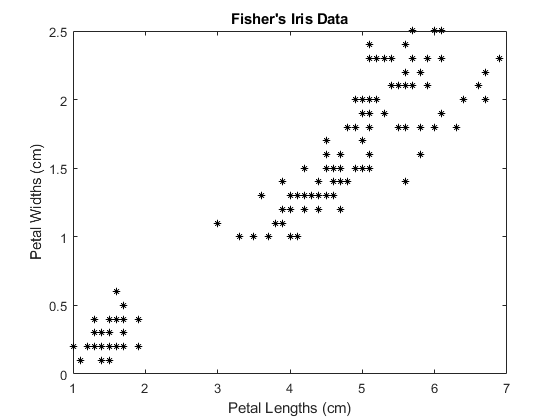 Use the petal lengths and widths as predictors. The larger cluster seems to be split into a lower variance region and a higher variance region. This might indicate that the larger cluster is two, overlapping clusters. Cluster the data. Specify k = 3 clusters. kmeans uses the k-means++ algorithm for centroid initialization and squared Euclidean distance by default. It is good practice to search for lower, local minima by setting the 'Replicates' name-value pair argument. idx is a vector of predicted cluster indices corresponding to the observations in X. C is a 3-by-2 matrix containing the final centroid locations. Use kmeans to compute the distance from each centroid to points on a grid. To do this, pass the centroids (C) and points on a grid to kmeans, and implement one iteration of the algorithm. Warning: Failed to converge in 1 iterations. kmeans displays a warning stating that the algorithm did not converge, which you should expect since the software only implemented one iteration. Randomly generate the sample data. There appears to be two clusters in the data. Partition the data into two clusters, and choose the best arrangement out of five initializations. Display the final output. Replicate 1, 3 iterations, total sum of distances = 201.533. Replicate 2, 5 iterations, total sum of distances = 201.533. Replicate 3, 3 iterations, total sum of distances = 201.533. Replicate 4, 3 iterations, total sum of distances = 201.533. Replicate 5, 2 iterations, total sum of distances = 201.533. By default, the software initializes the replicates separately using k-means++. Plot the clusters and the cluster centroids. You can determine how well separated the clusters are by passing idx to silhouette. Clustering large data sets might take time, particularly if you use online updates (set by default). If you have a Parallel Computing Toolbox ™ license and you set the options for parallel computing, then kmeans runs each clustering task (or replicate) in parallel. And, if Replicates>1, then parallel computing decreases time to convergence. 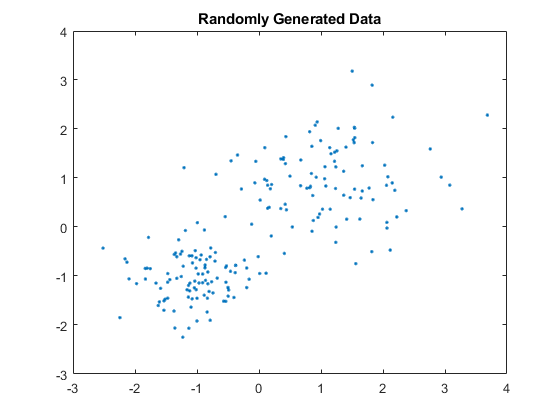 Randomly generate a large data set from a Gaussian mixture model. Mdl is a 30-dimensional gmdistribution model with 20 components. X is a 10000-by-30 matrix of data generated from Mdl. Specify the options for parallel computing. The input argument 'mlfg6331_64' of RandStream specifies to use the multiplicative lagged Fibonacci generator algorithm. options is a structure array with fields that specify options for controlling estimation. 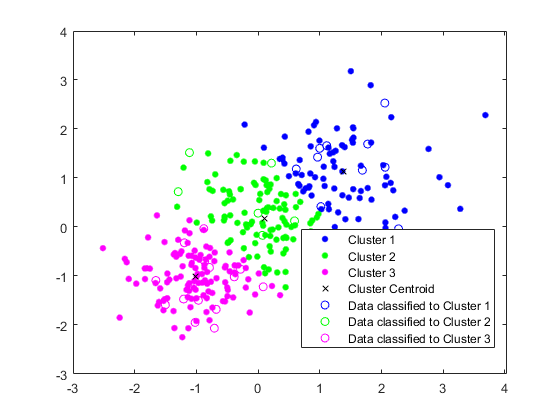 Cluster the data using k-means clustering. Specify that there are k = 20 clusters in the data and increase the number of iterations. Typically, the objective function contains local minima. Specify 10 replicates to help find a lower, local minimum. Replicate 5, 72 iterations, total sum of distances = 7.73161e+06. Replicate 1, 64 iterations, total sum of distances = 7.72988e+06. Replicate 3, 68 iterations, total sum of distances = 7.72576e+06. Replicate 4, 84 iterations, total sum of distances = 7.72696e+06. Replicate 6, 82 iterations, total sum of distances = 7.73006e+06. Replicate 7, 40 iterations, total sum of distances = 7.73451e+06. Replicate 2, 194 iterations, total sum of distances = 7.72953e+06. Replicate 9, 105 iterations, total sum of distances = 7.72064e+06. Replicate 10, 125 iterations, total sum of distances = 7.72816e+06. Replicate 8, 70 iterations, total sum of distances = 7.73188e+06. Elapsed time is 61.915955 seconds. The Command Window indicates that six workers are available. The number of workers might vary on your system. The Command Window displays the number of iterations and the terminal objective function value for each replicate. The output arguments contain the results of replicate 9 because it has the lowest total sum of distances. kmeans performs k-means clustering to partition data into k clusters. When you have a new data set to cluster, you can create new clusters that include the existing data and the new data by using kmeans. 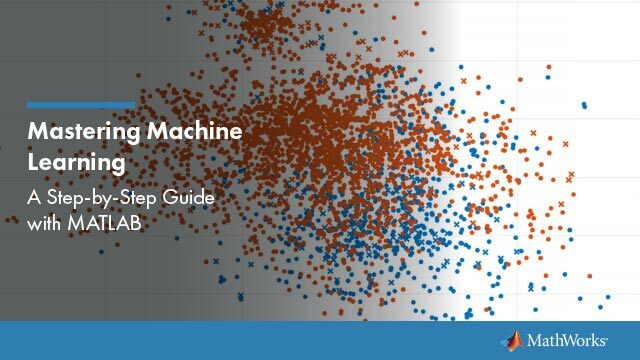 The kmeans function supports C/C++ code generation, so you can generate code that accepts training data and returns clustering results, and then deploy the code to a device. In this workflow, you must pass training data, which can be of considerable size. To save memory on the device, you can separate training and prediction by using kmeans and pdist2, respectively. Use kmeans to create clusters in MATLAB® and use pdist2 in the generated code to assign new data to existing clusters. For code generation, define an entry-point function that accepts the cluster centroid positions and the new data set, and returns the index of the nearest cluster. Then, generate code for the entry-point function. Generating C/C++ code requires MATLAB® Coder™. Generate a training data set using three distributions. Partition the training data into three clusters by using kmeans. Generate a test data set. Classify the test data set using the existing clusters. Find the nearest centroid from each test data point by using pdist2. Plot the test data and label the test data using idx_test by using gscatter. Generate C code that assigns new data to the existing clusters. Note that generating C/C++ code requires MATLAB® Coder™. Define an entry-point function named findNearestCentroid that accepts centroid positions and new data, and then find the nearest cluster by using pdist2. Add the %#codegen compiler directive (or pragma) to the entry-point function after the function signature to indicate that you intend to generate code for the MATLAB algorithm. Adding this directive instructs the MATLAB Code Analyzer to help you diagnose and fix violations that would cause errors during code generation. Note: If you click the button located in the upper-right section of this page and open this example in MATLAB®, then MATLAB® opens the example folder. This folder includes the entry-point function file. Generate code by using codegen. Because C and C++ are statically typed languages, you must determine the properties of all variables in the entry-point function at compile time. To specify the data type and array size of the inputs of findNearestCentroid, pass a MATLAB expression that represents the set of values with a certain data type and array size by using the -args option. For details, see Specify Variable-Size Arguments for Code Generation. codegen generates the MEX function findNearestCentroid_mex with a platform-dependent extension. isequal returns logical 1 (true), which means all the inputs are equal. The comparison confirms that the pdist2 function, the findNearestCentroid function, and the MEX function return the same index. You can also generate optimized CUDA® code using GPU Coder™. For more information on code generation, see General Code Generation Workflow. For more information on GPU coder, see Getting Started with GPU Coder (GPU Coder) and Supported Functions (GPU Coder). Data, specified as a numeric matrix. The rows of X correspond to observations, and the columns correspond to variables. If X is a numeric vector, then kmeans treats it as an n-by-1 data matrix, regardless of its orientation. Number of clusters in the data, specified as a positive integer. Example: 'Distance','cosine','Replicates',10,'Options',statset('UseParallel',1) specifies the cosine distance, 10 replicate clusters at different starting values, and to use parallel computing. Distance metric, in p-dimensional space, used for minimization, specified as the comma-separated pair consisting of 'Distance' and 'sqeuclidean', 'cityblock', 'cosine', 'correlation', or 'hamming'. 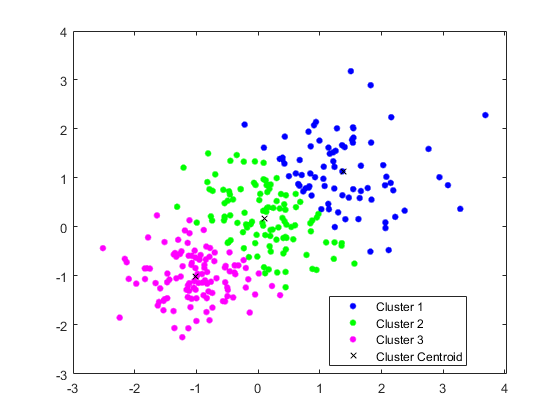 kmeans computes centroid clusters differently for the different, supported distance metrics. This table summarizes the available distance metrics. In the formulae, x is an observation (that is, a row of X) and c is a centroid (a row vector). Squared Euclidean distance (default). Each centroid is the mean of the points in that cluster. Sum of absolute differences, i.e., the L1 distance. 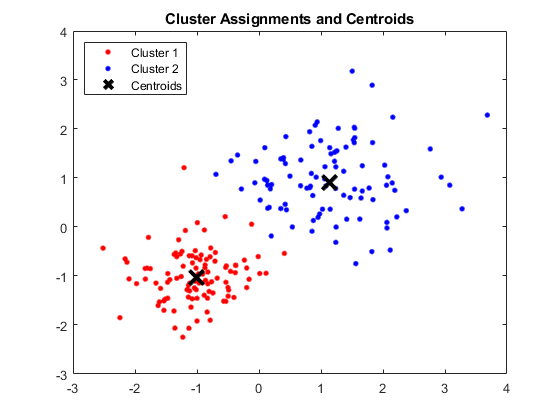 Each centroid is the component-wise median of the points in that cluster. One minus the cosine of the included angle between points (treated as vectors). Each centroid is the mean of the points in that cluster, after normalizing those points to unit Euclidean length. One minus the sample correlation between points (treated as sequences of values). Each centroid is the component-wise mean of the points in that cluster, after centering and normalizing those points to zero mean and unit standard deviation. 1→p is a row vector of p ones. This metric is only suitable for binary data. It is the proportion of bits that differ. Each centroid is the component-wise median of points in that cluster. where I is the indicator function. Action to take if a cluster loses all its member observations, specified as the comma-separated pair consisting of 'EmptyAction' and one of the following options. Treat an empty cluster as an error. Remove any clusters that become empty. kmeans sets the corresponding return values in C and D to NaN. Create a new cluster consisting of the one point furthest from its centroid (default). Maximum number of iterations, specified as the comma-separated pair consisting of 'MaxIter' and a positive integer. Online update flag, specified as the comma-separated pair consisting of 'OnlinePhase' and 'off' or 'on'. If OnlinePhase is on, then kmeans performs an online update phase in addition to a batch update phase. The online phase can be time consuming for large data sets, but guarantees a solution that is a local minimum of the distance criterion. In other words, the software finds a partition of the data in which moving any single point to a different cluster increases the total sum of distances. Options for controlling the iterative algorithm for minimizing the fitting criteria, specified as the comma-separated pair consisting of 'Options' and a structure array returned by statset. Supported fields of the structure array specify options for controlling the iterative algorithm. This table summarizes the supported fields. Note that the supported fields require Parallel Computing Toolbox™. You have an open parallel pool. In this case, use a cell array the same size as the parallel pool. If a parallel pool is not open, then Streams must supply a single random number stream. If true and Replicates > 1, then kmeans implements the k-means algorithm on each replicate in parallel. If Parallel Computing Toolbox is not installed, then computation occurs in serial mode. The default is false, indicating serial computation. 'UseSubstreams' Set to true to compute in parallel in a reproducible fashion. The default is false. To compute reproducibly, set Streams to a type allowing substreams: 'mlfg6331_64' or 'mrg32k3a'. To ensure more predictable results, use parpool and explicitly create a parallel pool before invoking kmeans and setting 'Options',statset('UseParallel',1). Number of times to repeat clustering using new initial cluster centroid positions, specified as the comma-separated pair consisting of 'Replicates' and an integer. kmeans returns the solution with the lowest sumd. You can set 'Replicates' implicitly by supplying a 3-D array as the value for the 'Start' name-value pair argument. Method for choosing initial cluster centroid positions (or seeds), specified as the comma-separated pair consisting of 'Start' and 'cluster', 'plus', 'sample', 'uniform', a numeric matrix, or a numeric array. This table summarizes the available options for choosing seeds. Perform a preliminary clustering phase on a random 10% subsample of X when the number of observations in the subsample is greater than k. This preliminary phase is itself initialized using 'sample'. If the number of observations in the random 10% subsample is less than k, then the software selects k observations from X at random. 'plus' (default) Select k seeds by implementing the k-means++ algorithm for cluster center initialization. 'sample' Select k observations from X at random. 'uniform' Select k points uniformly at random from the range of X. Not valid with the Hamming distance. numeric matrix k-by-p matrix of centroid starting locations. The rows of Start correspond to seeds. The software infers k from the first dimension of Start, so you can pass in  for k.
numeric array k-by-p-by-r array of centroid starting locations. The rows of each page correspond to seeds. The third dimension invokes replication of the clustering routine. Page j contains the set of seeds for replicate j. The software infers the number of replicates (specified by the 'Replicates' name-value pair argument) from the size of the third dimension. The software treats NaNs as missing data, and removes any row of X containing at least one NaN. Removing rows of X reduces the sample size. Cluster indices, returned as a numeric column vector. idx has as many rows as X, and each row indicates the cluster assignment of the corresponding observation. Cluster centroid locations, returned as a numeric matrix. C is a k-by-p matrix, where row j is the centroid of cluster j.
Within-cluster sums of point-to-centroid distances, returned as a numeric column vector. sumd is a k-by-1 vector, where element j is the sum of point-to-centroid distances within cluster j.
Distances from each point to every centroid, returned as a numeric matrix. D is an n-by-k matrix, where element (j,m) is the distance from observation j to centroid m.
k-means clustering, or Lloyd’s algorithm , is an iterative, data-partitioning algorithm that assigns n observations to exactly one of k clusters defined by centroids, where k is chosen before the algorithm starts. Choose k initial cluster centers (centroid). For example, choose k observations at random (by using 'Start','sample') or use the k-means ++ algorithm for cluster center initialization (the default). Compute point-to-cluster-centroid distances of all observations to each centroid. Batch update — Assign each observation to the cluster with the closest centroid. Online update — Individually assign observations to a different centroid if the reassignment decreases the sum of the within-cluster, sum-of-squares point-to-cluster-centroid distances. Compute the average of the observations in each cluster to obtain k new centroid locations. Repeat steps 2 through 4 until cluster assignments do not change, or the maximum number of iterations is reached. The k-means++ algorithm uses an heuristic to find centroid seeds for k-means clustering. According to Arthur and Vassilvitskii , k-means++ improves the running time of Lloyd’s algorithm, and the quality of the final solution. The k-means++ algorithm chooses seeds as follows, assuming the number of clusters is k.
Select an observation uniformly at random from the data set, X. The chosen observation is the first centroid, and is denoted c1. Compute distances from each observation to c1. Denote the distance between cj and the observation m as d(xm,cj). Compute the distances from each observation to each centroid, and assign each observation to its closest centroid. where Cp is the set of all observations closest to centroid cp and xm belongs to Cp. That is, select each subsequent center with a probability proportional to the distance from itself to the closest center that you already chose. Repeat step 4 until k centroids are chosen. Arthur and Vassilvitskii  demonstrate, using a simulation study for several cluster orientations, that k-means++ achieves faster convergence to a lower sum of within-cluster, sum-of-squares point-to-cluster-centroid distances than Lloyd’s algorithm. kmeans uses a two-phase iterative algorithm to minimize the sum of point-to-centroid distances, summed over all k clusters. This first phase uses batch updates, where each iteration consists of reassigning points to their nearest cluster centroid, all at once, followed by recalculation of cluster centroids. This phase occasionally does not converge to solution that is a local minimum. That is, a partition of the data where moving any single point to a different cluster increases the total sum of distances. This is more likely for small data sets. The batch phase is fast, but potentially only approximates a solution as a starting point for the second phase. This second phase uses online updates, where points are individually reassigned if doing so reduces the sum of distances, and cluster centroids are recomputed after each reassignment. Each iteration during this phase consists of one pass though all the points. This phase converges to a local minimum, although there might be other local minima with lower total sum of distances. In general, finding the global minimum is solved by an exhaustive choice of starting points, but using several replicates with random starting points typically results in a solution that is a global minimum. If Replicates = r > 1 and Start is plus (the default), then the software selects r possibly different sets of seeds according to the k-means++ algorithm. If you enable the UseParallel option in Options and Replicates > 1, then each worker selects seeds and clusters in parallel. Arthur, David, and Sergi Vassilvitskii. “K-means++: The Advantages of Careful Seeding.” SODA ‘07: Proceedings of the Eighteenth Annual ACM-SIAM Symposium on Discrete Algorithms. 2007, pp. 1027–1035. Lloyd, Stuart P. “Least Squares Quantization in PCM.” IEEE Transactions on Information Theory. Vol. 28, 1982, pp. 129–137. Seber, G. A. F. Multivariate Observations. Hoboken, NJ: John Wiley & Sons, Inc., 1984. Spath, H. Cluster Dissection and Analysis: Theory, FORTRAN Programs, Examples. Translated by J. Goldschmidt. New York: Halsted Press, 1985. 'Display' — Default value is 'iter'. 'Options' — Supports only the 'TolFun' field of the structure array created by statset. The default value of 'TolFun' is 1e-4. The kmeans function uses the value of 'TolFun' as the termination tolerance for the within-cluster sums of point-to-centroid distances. For example, you can specify 'Options',statset('TolFun',1e-8). 'Start' — Supports only 'plus', 'sample', and a numeric array. If the Start method uses random selections, the initial centroid cluster positions might not match MATLAB®. If the number of rows in X is fixed, code generation does not remove rows of X that contain a NaN. The cluster centroid locations in C can have a different order than in MATLAB. In this case, the cluster indices in idx have corresponding differences. If you provide Display, its value must be 'off'. If you provide Streams, it must be empty and UseSubstreams must be false. Some computations can execute in parallel even when Replicates is 1. For large data sets, when Replicates is 1, consider setting the UseParallel option to true. kmeans uses parfor to create loops that run in parallel on supported shared-memory multicore platforms. Loops that run in parallel can be faster than loops that run on a single thread. If your compiler does not support the Open Multiprocessing (OpenMP) application interface or you disable OpenMP library, MATLAB Coder™ treats the parfor-loops as for-loops. To find supported compilers, see Supported Compilers. To save memory on the device to which you deploy generated code, you can separate training and prediction by using kmeans and pdist2, respectively. Use kmeans to create clusters in MATLAB and use pdist2 in the generated code to assign new data to existing clusters. For code generation, define an entry-point function that accepts the cluster centroid positions and the new data set, and returns the index of the nearest cluster. Then, generate code for the entry-point function. For an example, see Assign New Data to Existing Clusters and Generate C/C++ Code. For more information on code generation, see Introduction to Code Generation and General Code Generation Workflow.